Connections is a newsletter for alumni and friends of URPL. Each issue features student articles, an update from the department chair, faculty information and accomplishments, and a section for alumni to share their news with the department and each other. 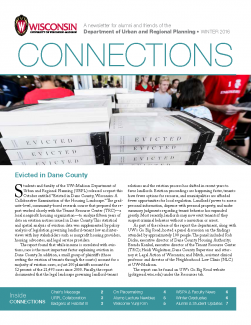 If you are interested in sharing your news with the URPL community through the Connections newsletter, please send an email to info@dpla.wisc.edu.